Different types of slabs will suit different soil types and house designs. What is a ground level concrete slab sub floor? A ground level slab is a large flat stretch of concrete, usually between 100 – 500mm thick which forms the foundation of your house. The type of slab you use (and even whether or not a slab is appropriate) will depend on the nature of the soil on your land and what kind of house you intend to build. What is a slab subfloor made of? Slab subfloors are primarily made of concrete, though other materials like steel mesh or rebar are also incorporated to add strength. 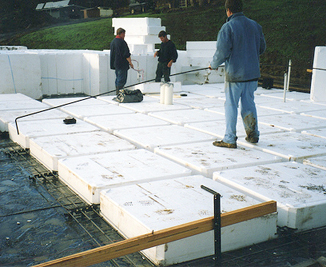 To improve stability, the slab typically sits on a bedding of building sand and will require a plastic vapour barrier. What types of slab floors are there? Class P - 'Problem' soil, which experiences land slip, mine subsidence and so forth. 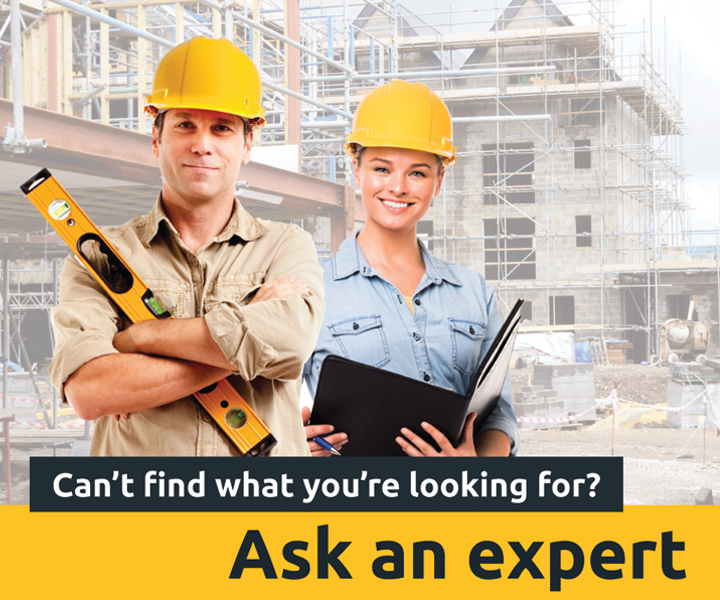 If you are building on Class P site you will typically need to consult an engineer. Slab on the ground - This is the simplest type of slab. It incorporates stiffening beams made from pre-poured concrete in trenches around the outside of the slab, and has a slab thickness of 100mm. This type of slab is suitable for Class A and Class S sites. Stiffened raft slab - Similar to the slab on the ground, but also has pre-poured concrete beams set in channels through the middle of the slab, creating a kind of supporting grid of concrete on the base of the slab. Most slabs in Australia are stiffened raft slabs. The slabs may also need additional concrete footing embedded in the soil, depending on the soil type, and are generally suited to Class M, Class H and Class E soils. 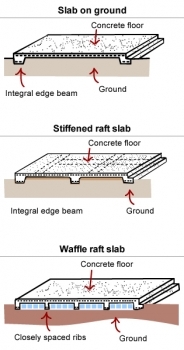 Waffle raft slab (also known as a waffle pod slab) - These slabs are constructed entirely above the ground by pouring concrete over a grid of polystyrene blocks known as 'void forms'. Waffle raft slabs are generally suitable for sites with less reactive soil, use about 30% less concrete and 20% less steel than a stiffened raft slab, and are generally cheaper and easier to install than other types (even in bad weather). These types of slab are only suitable for very flat ground. On sloping ground or with more complex designs, a stiffened raft slab is normally the better option. Waffle raft slabs are suited to lightly and moderately reactive clay sites in particular, because they're not embedded in the ground like stiffened raft slabs. Waffle raft slabs are best suited for Class A, Class S, Class M, Class H and Class E soils (although you should consult an engineer about the suitability of the slab for very reactive soils, and generally to confirm this type of slab is suitable for your site). Pier and slab - On sites with more reactive soils, it's common for concrete piers to be sunken into the soil to improve stability. This is normally done by digging holes at intervals and depths determined by an engineer, then pouring concrete into them and attaching the slab to these piers. A waffle raft slab under construction. How is a concrete slab sub floor installed? For a standard slab on the ground, first the site is scraped back to the soil, keeping it as level as possible and ridding it of all plant matter. Then, formwork is put up around the edges of the slab to prevent the concrete from spreading. Trenches are dug around the edges for all stiffening beams, and bedding sand is laid down to level things out. A plastic vapour barrier is used to coat the site and prevent dampness from rising through the slab. Rebar or mesh is then spread out to cover the area. In some situations a layer of gravel may be laid down to provide a solid base. The concrete is then poured on top, spread out and levelled. Housing slabs should ideally be left for 28 days to cure; this gives the slab extra strength and helps prevent cracking. Where are ground level concrete slab subfloors used? Ground slabs are very common these days and can be found almost anywhere in Australia where there is ready access to concrete. These foundations are generally used to support heavier building materials like brick and steel. What subfloor do I need?